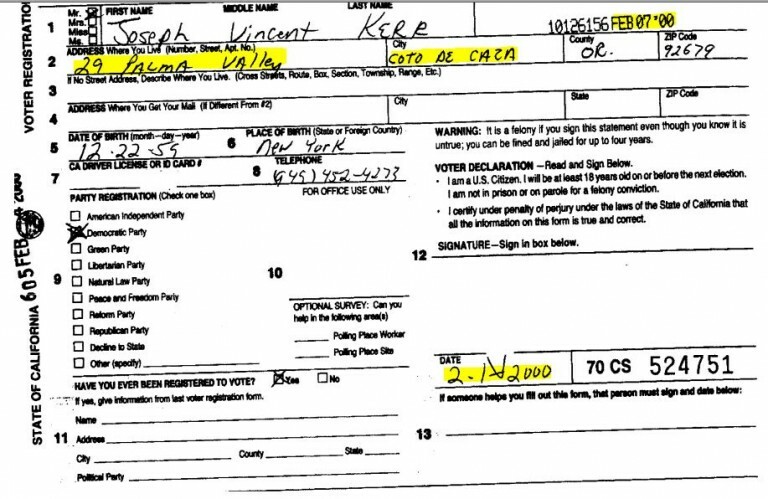 Looks like Coto de Caza millionaire/union executive Joseph Vincent Kerr registered to vote in Brea at the end of January. Why? Why to carpetbag his way into a political campaign for County Supervisor, representing us in the 4th District. Hmm. Now that’s not very good, is it. And Joe’s alleged new crib? It’s a rather depressing little box owned by one Douglas C. Martinson, also the name of a jailer for the Orange County Sheriff’s Department. So is Coto Joe really even living here? Hard to believe, isn’t it? 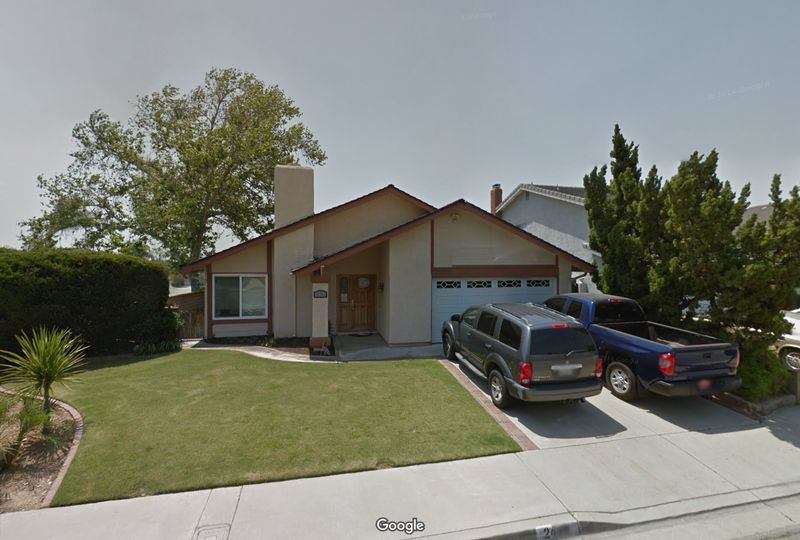 Just as hard to believe as Irvine McMansion owner Linda Ackerman living in some Fullerton dude’s game room; or Elegant Yorba Estate owner Harry Sidhu, living in the Calabria apartments – behind a pool hall and bowling alley. 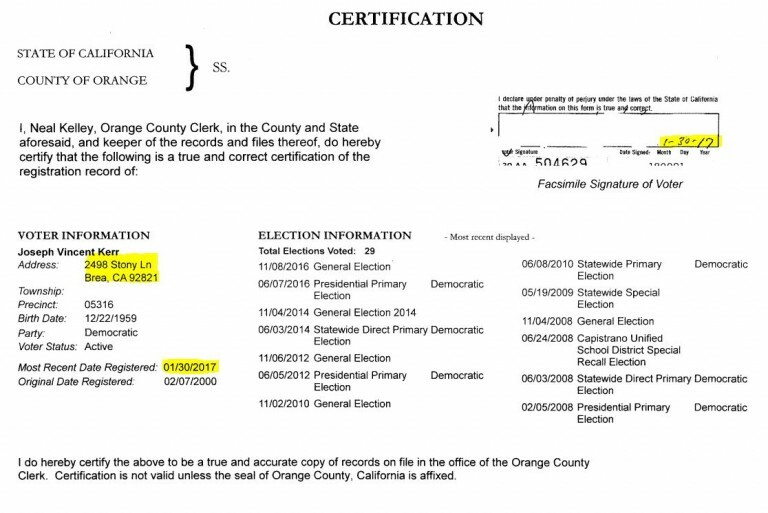 Like his carpetbagging predecessors, Coto Joe is wisely hanging on to his real estate – the big house in the swanky community behind guard gates, where his wife is still registered to vote. It’s not even listed for sale, although Joe declared his new abode, under penalty of perjury, ten weeks ago. Wish you had the resources to “surveil” him! One can always wonder if he and his wife have “separated”, but the change of address is very suspicious. Hope he reads this blog – giggle! 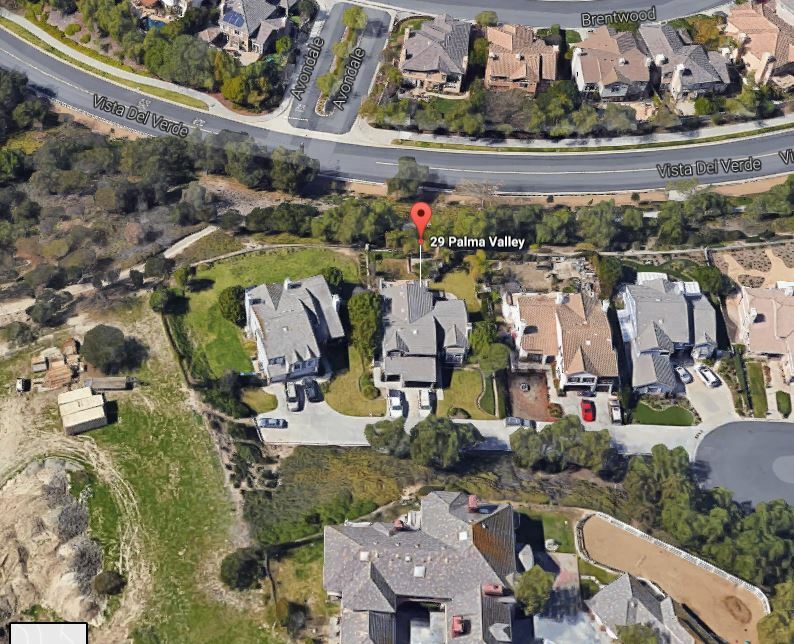 Well, now anyone can drive by 2498 Story Ln., Brea, CA, and see if Coto Joe is home. They could even do it every day, several times a day. Quite possible once he told her they were moving to Brea! China will stay behind so that her kid can finish out school in Coto. He’s about eight years old so it might take a decade or so. Are Brea schools so bad? 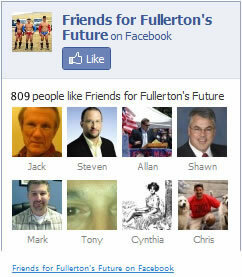 It looks like the Kerrs like little Joe mingling with the affluent Coto de Caza kids. The trouble with carpetbagging is that it always seems to introduce an array of embarrassments. Pretending to carpetbag is even worse since the pretense requires a whole tissue of lies and is very revealing about one’s true character. And then there’s that little inconvenience of perjury. Uh oh. I bet Coto Joe forgot to tell the missus about that part. Depends. Registering to vote at a house that you don’t actually live in is certainly a crime. A millionaire union executive wanting to represent a community he is not part of or how politics sinks to a new low. That’s a very old low. So since the Supervisor’s race is turning into a race of super villains with the Joker (Joe Kerr), the Penguin (Young Kim), and Two-Face (Bruce Whitaker) running for the office, maybe it’s time for the district to utilize the bat-signal to find an honest candidate that would put residents first? I love your post! Honest is the key word. I heard that Joe Imbriano is running too. Running from aliens, or black helicopters, or wifi. Something about the Joes. They got hot wives. If at first you don’t succeed, fail again! Are you sure Whitaker is running? Must be a super secret stealth campaign. The timing of a candidate’s announcement is everything. The 4th district’s election is not until 2018. Norby is Tony’s man. Tony will roll him out like a giant zig zag. He is the best way to get pot clinics opened on Tony’s properties. Democrats have recruited a Fountain Valley carpetbagger to run in California’s 39th Congressional District. http://www.ocregister.com/2017/06/05/vietnamese-immigrant-to-challenge-rep-ed-royce/ . 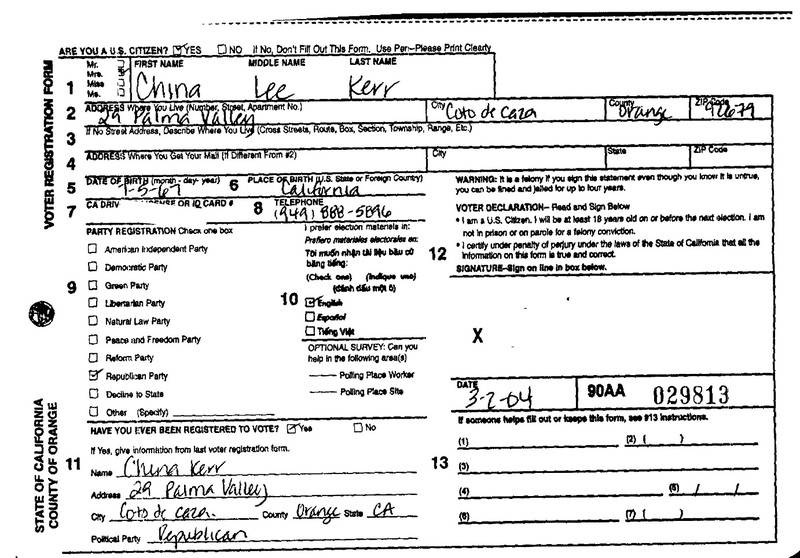 So far North OC has two carpetbaggers running for office now who is Joe Kerr for supervisor and Mai Khanh Tran for congress. Like Royce or not, there is already a Democrat in the race named Phil Janowicz. There should be a post about this Fountain Valley carpetbagger and the city is nowhere near the 39th congressional district. Smells like Sukhee Kang to me. So far, we have defeated carpetbaggers Harry Sidhu, Linda Ackerman, Lori Galloway, and Sukhee Kang in North Orange County regardless of party. Now for 2018, we have to deal with carpetbaggers like Joe Kerr and Mai Khanh-Tran which does not even live in the district and yet both carpetbaggers should be met with signs saying No Kerr Coto Carpetbagger and No Tran Fountain Valley carpetbagger.